Deviled eggs with bacon and cheddar cheese are a different way to make deviled eggs. These have such amazing flavor I know that your family or guests will love having more than one. I was amazed at how delicious they are. 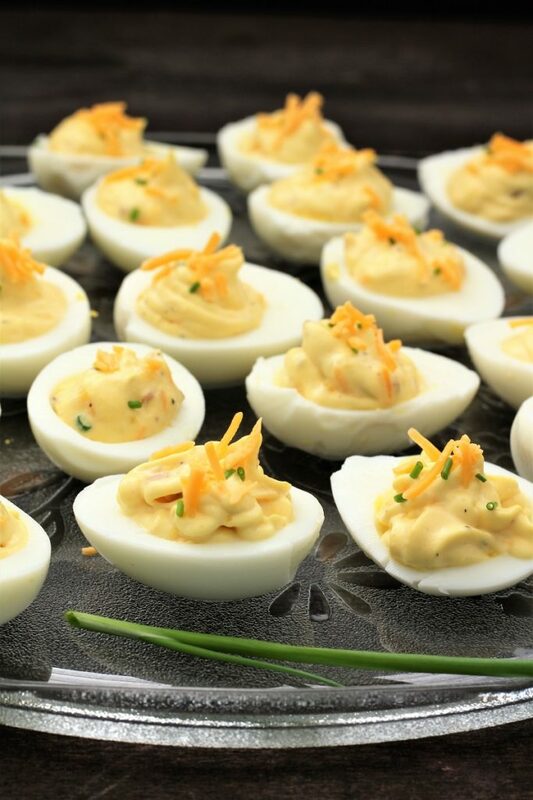 Easter is just around the corner and if you are having any kind of get together, I guarantee that you are going to want to try making these amazing deviled eggs with bacon and cheddar cheese. I really like them, and I am not even big on bacon. 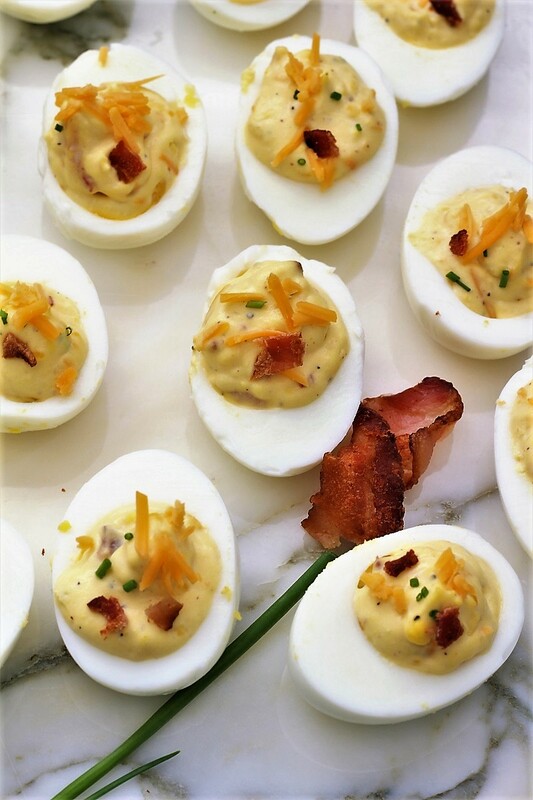 Deviled eggs with bacon and cheddar cheese are so rich and creamy. But I must tell you, speaking from experience that I decided since 14 eggs were so many, that I would go ahead and cook my eggs on top of the stove. When they were done, I placed them in a bowl of ice cold water. Then a few minutes later I went to peel them. I tried even adding more ice water and that didn’t help. The shells kept sticking. I think that there is nothing so frustrating as trying to peel a hard cooked egg and the shell sticks! So then I decided to put 5 eggs in the Instant Pot and I cooked them for 7 minutes. Then I let them self release. Then I put them in ice water and I was so happy that they peeled perfectly! Here is a picture of the different eggs! What do you think? The Instant Pot eggs are on the right. I must say that the ones in the Instant Pot peeled up so nice and quickly, I was so happy that I decided to try this little experiment. I have used my Instant pot before to hard cook eggs, and now I know for sure that this is the only way I will cook them from now on. Even if I have to cook more than one batch. I will be happy to do so just because I know that it will save me time when it comes to peeling the eggs. Plus they look so much prettier. It is worth it to cook them in the Instant Pot. This is what the eggs look like before you fill them. You can either use a spoon, or I used a frosting bag and squeezed the filling into the eggs to make my deviled eggs with bacon and cheddar cheese. It works out real well. But a spoon works too. Then you can dress the top up with a little extra cheese or even some bacon pieces or chives. This last week end we decided to do something different this year for the grand kids birthdays. We know that they do not really need any more toys or any more clothes and so we decided to make memories and do something fun with them one on one. It will be my grand daughters birthday this week and so we went and picked her up and her mom put her in our car. She was so excited until mom didn’t get in. She held out her hands and started screaming. Not the way a happy birthday gift is suppose to be. She cried and mom texted and said if she keeps crying bring her back. And so I said to my husband lets go up here to the Maverick and get her a Slurpee. She was still crying when we went inside. I asked her, “do you want a Slurpee”? She stopped crying and said that she did. We bought her a pink one and then after that she was just fine. These little kids sure do know how to get their parents worried. Then we took her to a place for kids that has a lot of fun activities. They tell stories and you can milk a cow, gather eggs, sit on a fake horse, climb a tree, play with trains and all kinds of other things. My husband and I were very impressed and the time went very quickly. They even had an area where it is like camping and there are all kinds of animals on the wall to look at. They also have puppets. Another fun thing that they have is a counter that looks like an old malt shop, and you can pretend like they are fixing you all of this fun food. There is a fire truck and a place that you can see what it is like to be in a police station. There is also another area where you can play with dolls, grocery shop, and pretend that you are a king or a queen. Then there is an area that has different countries that you can check out different books that are written in both the other language and English. Then after that we took her to McDonald’s. And then we took her her home and her mom told me that we really must have worn her out because she took a 3 hour nap and then she went to bed at her regular time. One thing that I do know for sure is that grandpa and grandma were worn out. However, we did not get a nap. I am looking forward to taking the other grand kids and I hope that they enjoy doing something with grandpa and grandma. I also better get planning an Easter egg hunt! And I will be making some more deviled eggs with bacon and cheddar cheese, and I know that at least my son-in-law that loves bacon is really going to enjoy them! 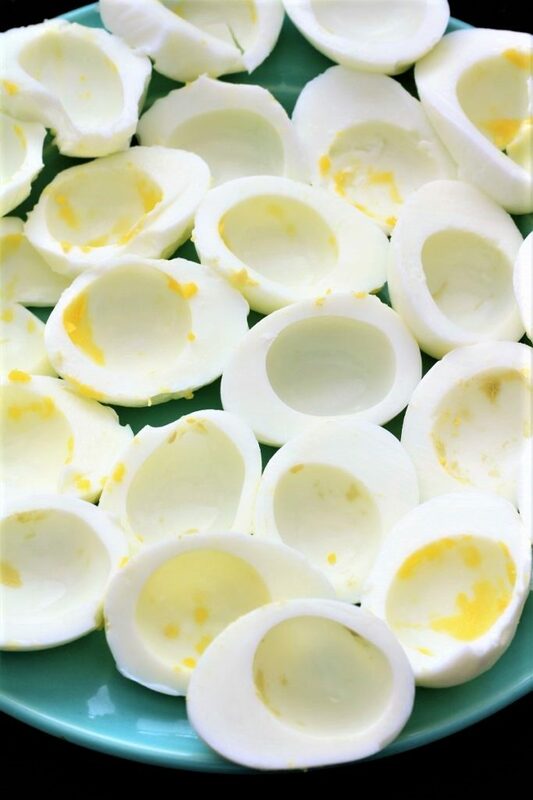 1- If you have an Instant Pot, cook the eggs in it, as it makes it so much easier to peel the eggs. 2- The original recipe for deviled eggs and bacon with cheddar cheese says to cook 14 eggs and mash 2 of them in with the egg yolks, but I just like mine with the bacon, cheese and chives. 3- If you do not want to use sour cream, you may substitute plain yogurt. Cook the eggs in an Instant Pot by adding a cup of water to the Instant pot. Place the eggs on the rack and turn the pressure cooker to 7 minutes, let it self release and then put the eggs in ice cold water. 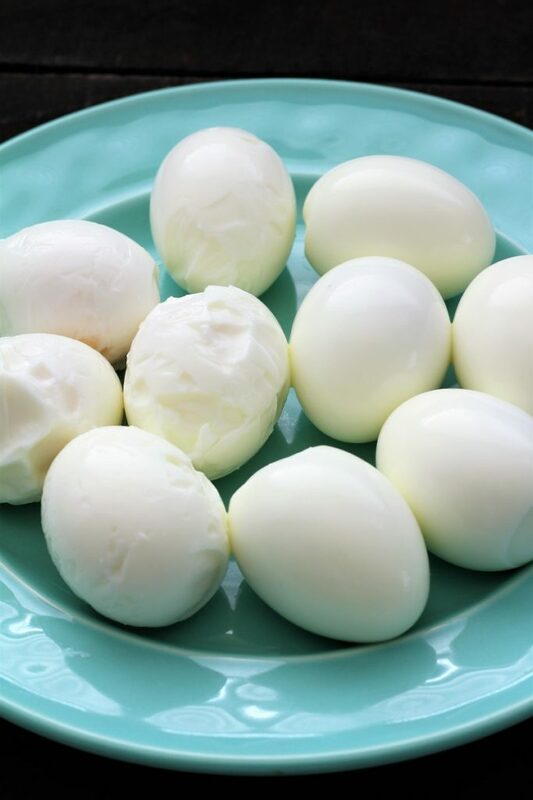 In a large pot place the uncooked eggs and cover them with water. Place a lid on top of the pan and turn the stove top off. Then carefully remove the water and replace it with cold water and I even put ice in mine; this helps the eggs peel more easily. Slice the eggs in half, the long way. Carefully remove the egg yolk into a medium size bowl. Then add to the egg yolks, the mayonnaise, sour cream, mustard, lemon juice, pepper, and onion salt; and mix the mixture all together with a fork. Then add the bacon, cheese and chives, mixing again. Place the egg halves onto a plate, with the hollowed size up. Divide the yolk mixture evenly into the egg halves. Cover with plastic wrap and refrigerate, allowing the flavors to blend for at least 1 hour. Deviled eggs are a must this time of year. I think I need to break out of my “traditional” deviled eggshell and try your recipe. Looks yummy! Dare I say I have never eaten or made deviled eggs before?!! These look yummy though! The perfect appetizer. Now I must try! We grew up coloring Easter eggs and then we would make deviled eggs. I really enjoyed finding a new twist to regular deviled eggs. I hope you get a chance to try them.